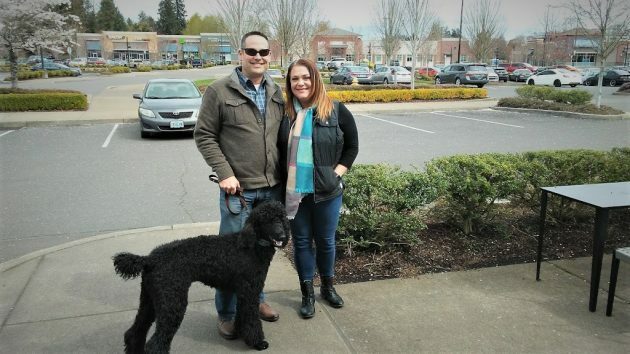 Brent Pockrus and Jen Healy with Prince Simon, who they say will be their resident store poodle. Jen Healy and Brent Pockrus say they have secured a lease on the building at 350 Hickory St. N.W. with its new owners and plan to move in on Aug. 1, continuing it as a garden center. Tom and Annette Krupicka, owners of Tom’s for 30 years, didn’t know about this when they told me Tuesday they had sold the building in January and the new owners, an investment group with an address in Corvallis, were looking for a tenant. After friends sent her Tuesday’s story on hh-today about Tom’s closing, Jen Healy emailed me to say that the location will continue as a garden center after all. Then I chatted with her and her spouse at North Albany’s Starbucks Wednesday afternoon. Both graduated from South Albany High School, Brent in 1991 and Jen in ’92. Both have long had an interest in — and work experience — in gardening-related matters, and in business too. For some years Jen operated a scrapbooking business, “I Remember When,” in Albany. In recent years she has worked in digital marketing, and also by helping out at Tom’s. Brent has a degree in occupational safety from OSU and works as a safety consultant to commercial contractors. They told me they intend to operate a full-service garden store, with an educational twist. Jen plans to organize classes in horticutural subjects and may also lead seminars for groups of neighbors in their gardens or yards. congrats Jen – you will do great with this!!! Ace still plan to add the garden center?